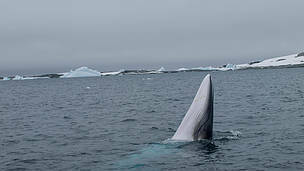 Japanese whalers have killed more than 50 minke whales this year in the Ross Sea Marine Protected Area (MPA) in Antarctica, WWF revealed today on the opening day of the International Whaling Commission (IWC) meeting in Brazil. Harvesting krill and fishing is banned in the Ross Sea MPA special protection zone, yet Japan is able to conduct whaling in this unique natural area through a “scientific whaling” loophole. WWF is calling on the IWC and the Commission for the Conservation of Antarctic Marine Living Resources (CCAMLR) to work together with the Japanese government to close this loophole and end the killing of whales in the Ross Sea MPA and the wider Southern Ocean sanctuary. “The Ross Sea MPA is supposed to have special protection from human activities to safeguard a wealth of Antarctic wildlife. People around the world who celebrated this historic ocean sanctuary will be shocked by the killing of whales within its boundaries. Only the IWC can close the loophole that enables whales to be harpooned in a protected area. CCAMLR needs to step up and take a role in working closer with IWC to ensure that happens. It is a travesty that Japan can go into an ocean sanctuary and harpoon whales." The Ross Sea MPA, one of the world’s largest protected areas covering 1.55 million sq km, was agreed by CCAMLR in 2016. The Commission is made up of 24-member states including Japan, and the EU. The MPA helps to protect many of the thousands of species that live in the Southern Ocean including Antarctic krill, emperor penguins, Weddell seals and a range of whale species including blue, humpback, minke and killer whales. But CCAMLR does not control whaling in the region– instead, any member country of the IWC can grant itself a special permit to whale. On the 31st March 2014, the International Court of Justice ruled that Japan should revoke all existing permits for ‘scientific whaling’ in the Southern Ocean and refrain from granting any further permits. Japan simply issued itself a new special permit called NewRep-A which leads to the killing of 333 Antarctic minke whales each year in the Southern Ocean until 2027. WWF discovered Japan’s five week killing spree through protected waters by analysing an IWC scientific committee paper. 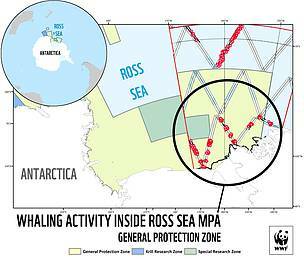 The map below shows Japan’s whaling activity in the General Protection Zone (GPZ) of the Ross Sea MPA, between 22 January and 28 February 2018, just 2 months after the Ross Sea MPA came into force. Inside this zone all fishing activity is restricted to protect habitats that are important to native marine mammals, birds, fish and invertebrates. Red dots show the sighting positions of Antarctic minke whales before they were killed. The lines are the search paths of three Japanese whaling ships. WWF collaborates with researchers designing and implementing non-lethal ways to study whales. Early this year, the first-ever ‘whale cam’ was deployed on an Antarctic minke whale by Dr Ari Friedlaender and WWF to study their feeding behaviour. 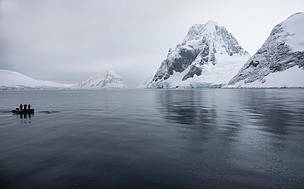 Twenty-four countries and the European Union are members of the Commission for the Conservation of Antarctic Marine Living Resources (CCAMLR) which aims to conserve Antarctic marine life. In October 2016, after nearly 10 years of negotiation, CCAMLR created the Ross Sea MPA, establishing the world's largest Marine Protected Area, and it came into effect on 1 December 2017. Japan, as a CCAMLR member, voted for the Ross Sea MPA. 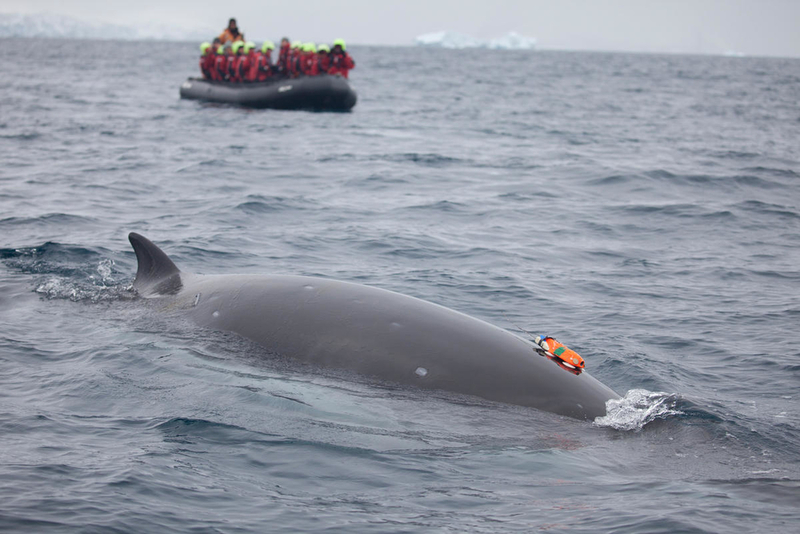 Researchers attaching a 'whale cam' to an Antarctic minke whale (Balaenoptera bonaerensis), Antarctic Peninsula. WWF is working in collaboration with international whale researchers to better understand how and where baleen whales in the Southern Ocean. Antarctic minke whale (Balaenoptera bonaerensis) with a 'whale cam' or a CATS suction cup video tag surfacing in front of tourists. Antarctic Peninsula. WWF is working in collaboration with international whale researchers to better understand how and where baleen whales in the Southern Ocean. 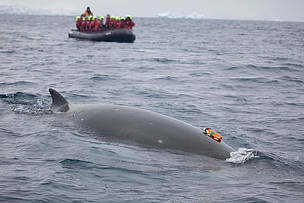 Researchers spotting an Antarctic minke whale (Balaenoptera bonaerensis), Antarctic Peninsula. WWF is working in collaboration with international whale researchers to better understand how and where baleen whales in the Southern Ocean. Antarctic minke whale (Balaenoptera bonaerensis) surfacing, Antarctic Peninsula. WWF is working in collaboration with international whale researchers to better understand how and where baleen whales in the Southern Ocean.